Does It Catch Mice? : Combine PBL and GBL. The software (and learning) we need. 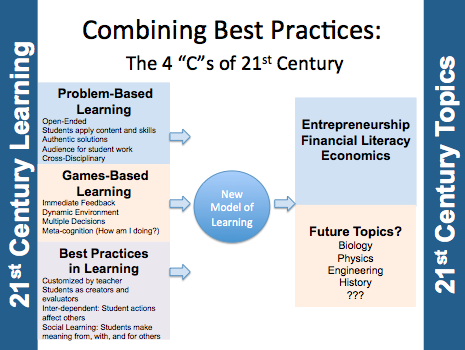 Combine PBL and GBL. The software (and learning) we need. In the last post, I explored the idea that creating quality Games-Based Learning resources aimed at real-world skills our students will need to succeed could be better understood by trying to integrate five essential elements that are essential in team sports. Students need to create and regularly be able to adjust that creation to solve a specific problem. Students are simultaneously evaluating the actions of each other and making adjustments accordingly. The player's actions effect the entire game and all who are playing. The game is dynamic, constantly changing due to the actions of the other players and the outside factors. There are multiple and competing goals with no right answer. So, the next question: How do we create and structure these types of experiences? We don't need to re-invent anything here; we know what good research tells us about quality learning. But we do need to consider those factors when we design software (or any learning classroom learning experience) for our students. Research tells us what students need to experience in order to be engaged in learning where they are constructing (and remembering) meaning. The table chart below comes from a presentation I shared at ISTE advocating the combination of Problem-Based Learning, Games-Based Learning and common Best (Classroom) Practices. I plan to talk more about these elements in future posts - especially in relation to the elements of team sports. But in the meantime, I share the chart below with a few concluding thoughts. 1. The left side (PBL, GBL, and Best Practices) include the characteristics of effective learning. If we structure experiences like this in school, would we feel better about our ability to prepare them for this future where they will be creators and social learners solving unknown problems in unknown environments? 2. Notice that the right hand side represents that topics that we need to focus upon. If we want engagement, then we need to structure problems that are relevant for students and for the 21st Century. That's a tall order - but it's important. With simCEO, we've chosen to do that by tapping into the topic of entrepreneurship and financial literacy. It's a vital topic - both in the business sense and "mindset" sense, producing students who can create and solve problems. And, it's a topic that sadly is squeezed out of the traditional school day at a time when it's never been so badly needed. If you want to see more about how we are using entrepreneurship to integrate the left-hand side characteristics, check out this presentation from the SIIA conference. But other topics are certainly possible (see chart). We want to explore more applications with this kind of learning, and hope others are too. Collaboration welcome. 3. Are there characteristics missing from the model? The better the model, the better the student experiences we can develop. 4. The more I share, the more I'm aware just how much great stuff is happening already. If anyone out there shares this interest in changing the way we learn, are using or developing similar resources, or simply want to be involved in the process, I'm always looking to expand my network. Share this and connect. This is incredibly valuable information. At Smarty Ants we share your view regarding a new model for learning. We believe strongly in the role of teachers-technology and learners working together to bring about outstanding results. Students are highly engaged in game based learning structures when they afford them the ability to choose the learning path which best meets their needs. These connections must provide for learning temperament as well as ability level to insure students progress at a pace best suited for their needs. Annie, Thanks. Sent you a tweet.